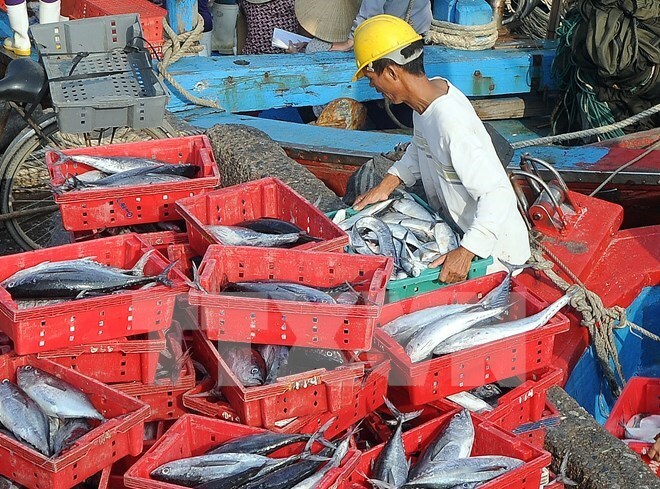 Thua Thien-Hue (VNA) – The administration of Thua Thien-Hue, a central province hit by the mass fish deaths earlier this year, has been asked to constantly supervise the payment of compensatory money to the affected residents. Officials of the Ministry of Agriculture and Rural Development made the request during a working session on the issue with the provincial People’s Committee on October 14. Total compensation for damage caused by the mass fish deaths, resulted by flawed waste and wastewater treatment of Taiwan-invested Hung Nghiep Formosa Ha Tinh Steel Co. Ltd, in Thua Thien-Hue is over 749.76 billion VND (33.74 million USD), according to the provincial Department of Agriculture and Rural Development. The People’s Committee has decided to allocate 400 billion VND sourced from the compensation advance to Phong Dien, Quang Dien, Phu Vang and Phu Loc districts and Huong Tra town. These localities are publicizing the lists of affected residents. After the publication period (3-5 days), the payment will be made after complaints, if any, are solved, local officials said. Aside from Thua Thien-Hue, three other central provinces were also influenced by the marine pollution, namely Ha Tinh, Quang Binh and Quang Tri. The Ministry of Finance has transferred 3 trillion VND (135 million USD) to the four provinces, including 400 billion VND for Thua Thien-Hue. The money is part of the 500 million USD compensation paid by Formosa Ha Tinh.